Captain America: Fallen Son ORIGINAL Comic Art #3 pg 18 Hawkeye SPLASH Romita. 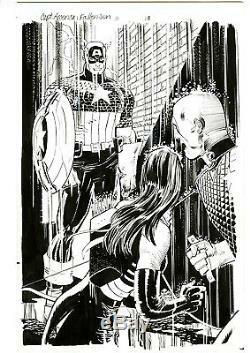 This original comic art piece of page #18 from Captain America: Fallen Son #3 is a great piece by John Romita Jr. The splash page features Hawkeye (Clint Barton disguised as Captain America) confronting Hawkeye (Kate Bishop) and Patriot in the rain. Scroll Down For More Pictures Below.... We take pride in packing all the orders we receive carefully. THIS IS NOT WHAT WE DO.... All orders, no matter what the price of the item, gets boutique professional packing treatment. Boxes will be able to be used unless discussed prior. INTERNATIONAL packages ARE NOT FREE! Some of these services are not the cheapest, but they are the fastest and safest. The shorter the time a package is in transit, the lesser the chance for a problem to occur. The item "Captain America Fallen Son ORIGINAL Comic Art #3 pg 18 Hawkeye SPLASH Romita" is in sale since Sunday, February 12, 2017. This item is in the category "Collectibles\Comics\Original Comic Art\Splash Pages". The seller is "sparklecitycomics" and is located in Middletown, New York. This item can be shipped worldwide.